Click here to view the solution for Solitaire Dominoes puzzle 18 - Solitaire Dominoes 7x8. I hope you managed to solve it and had a lot of fun trying to do so. Is solving Solitaire Dominoes puzzles a passion for you? You will most certainly enjoy today's Solitaire Dominoes puzzle. How to play Solitaire Dominoes: On the board the domino numbers are shown, but the borders between dominoes are missing. The task is to restore borders between domino tiles. A domino is a pair of numbers. You can have only one of each pair. 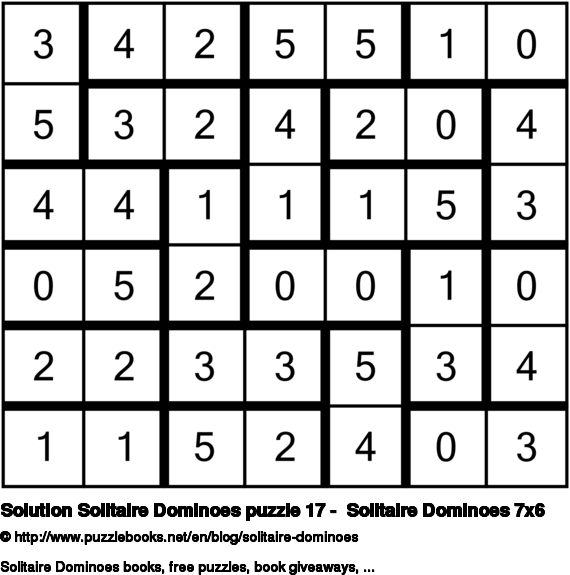 Click here to view the solution for Solitaire Dominoes puzzle 17 - Solitaire Dominoes 7x6. I hope you managed to solve it and had a lot of fun trying to do so. Try this week's Solitaire Dominoes puzzle. It is ideal for kids to learn how to solve Solitaire Dominoes puzzle. 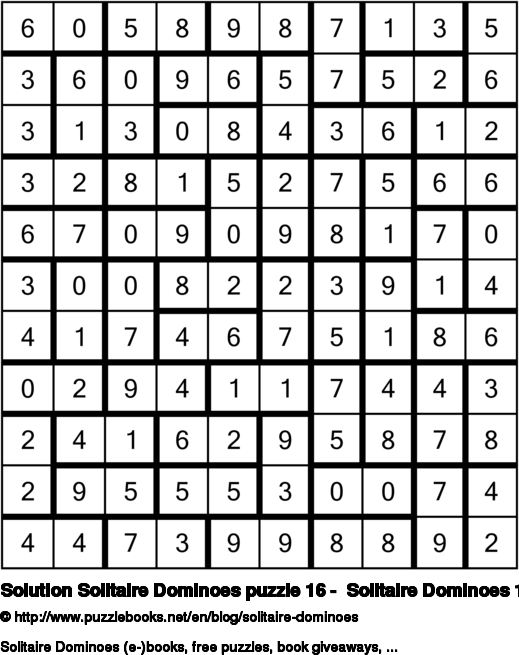 Click here to view the solution for Solitaire Dominoes puzzle 16 - Solitaire Dominoes 10x11. I hope you managed to solve it and had a lot of fun trying to do so. Click here to view the solution for Solitaire Dominoes puzzle 15 - Solitaire Dominoes 10x9. I hope you managed to solve it and had a lot of fun trying to do so. Solitaire Dominoes puzzles are really fun brain games. 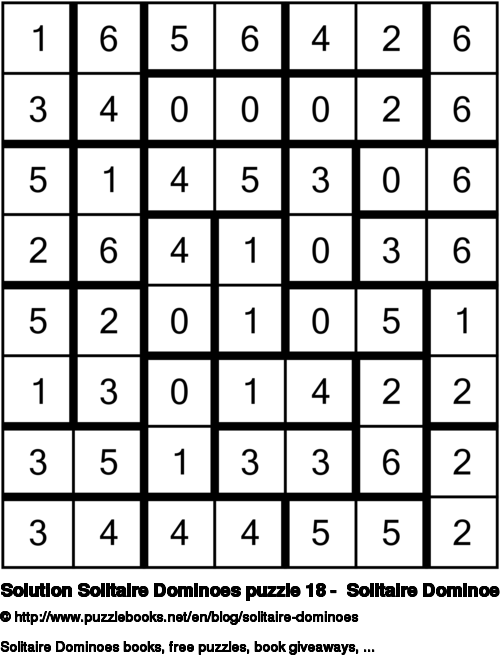 This logic puzzle will give your brain a great exercise. 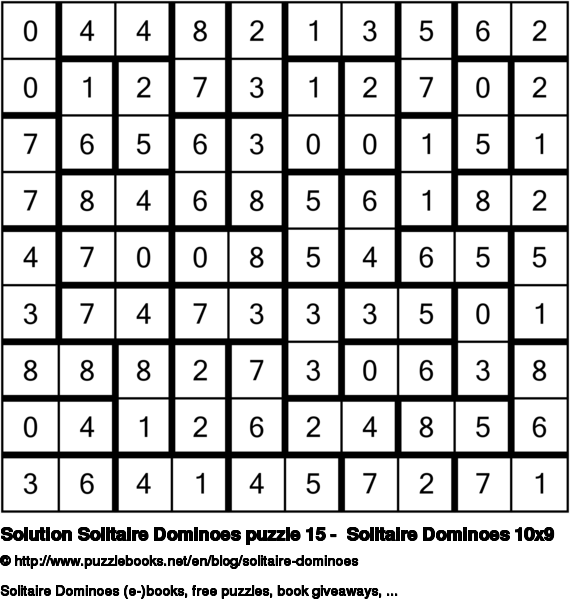 Click here to view the solution for Solitaire Dominoes puzzle 14 - Solitaire Dominoes 9x10. I hope you managed to solve it and had a lot of fun trying to do so. Hooked on Solitaire Dominoes puzzles? Today I have another Solitaire Dominoes puzzle for you. 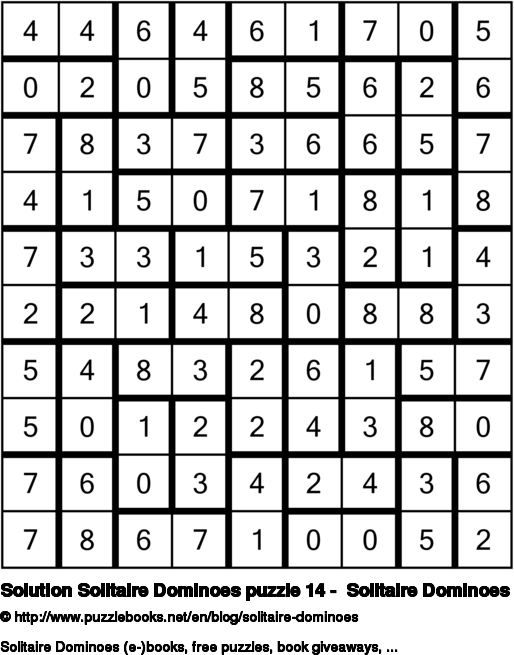 Lots of fun trying to solve it.